Independent file photo Members of the Minneota volleyball team celebrate after scoring a point during a match at the Southwest Challenge on Sept. 8. The Vikings will begin their state tournament play today against New York Mills. 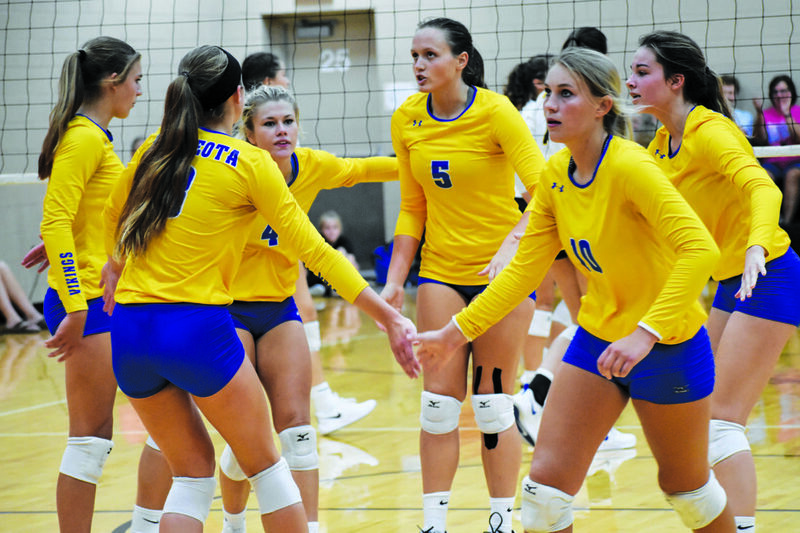 MINNEOTA – The Minneota volleyball team’s bid for a Class A title came up just short a season ago when the Vikings fell to Mayer Lutheran in the championship match. This time, the Vikings are focused on rewriting a different ending and are coming into the state tournament on a roll. Minneota enters with an overall record of 33-1 and is coming off a clean sweep over Adrian in the Section 3A Championship on Saturday. 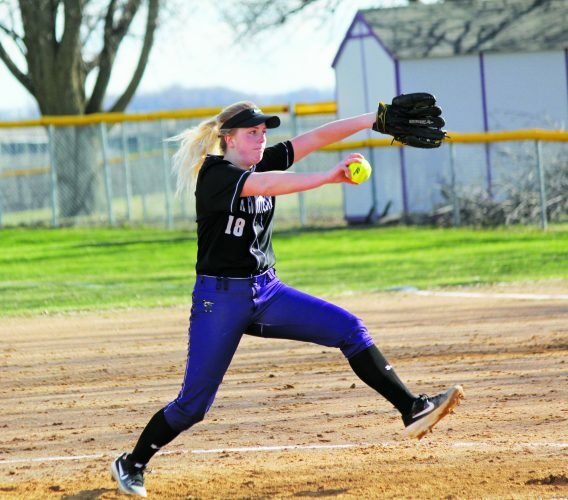 Vikings coach Hayley Fruin said it feels good to return to the state tournament and is glad to see that their hard work throughout the season has paid off to get there. Minneota is making its 12th overall appearance in the tournament. Meanwhile, their opponent New York Mills is making its third overall trip to state and first since 1981. Fruin said they haven’t seen much of New York Mills this year, but knows the Eagles will present a tough challenge and will be led by a strong mix of juniors and seniors. Fruin said their main focus during practice to prepare is to clean up some things on both sides of the net and make sure they maintain their aggressiveness on defense, especially up front. The Vikings possess a barrage of different skill players, led by senior outside hitter Lydia Sussner. Sussner, who was announced as a finalist for the Ms. Baden Volleyball Award, is joined by fellow seniors Lizzy Gillingham, Morgan Kockelman, Brooklyn Nelson and Sydney Larson as well as junior Morgan Hennen, sophomore Abby Hennen and freshman Natalee Rolbiecki. 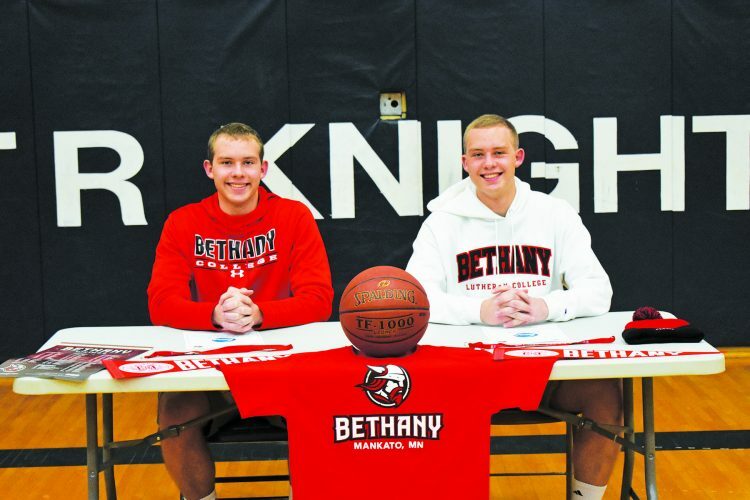 Kockelman added that their main goal is to just stick together as a team and not focus on individual success. The Vikings also earned the No. 1 seed in the tournament. Fruin is glad to see their hard work rewarded with a high seed and feels they’ve done a good job of keeping their focus on what they want as a team this season. Today’s quarterfinal matchup begins at 1 p.m. Going into the tournament, Fruin knows the pressures of playing at the biggest level and wants to make it count in their final few games. Gillingham said they’re looking forward to getting another opportunity to play on a big stage and they want to end the season strongly.